We delighted our patrons with the Maibock last year, being that it was our first Lager. Lagers are different than ales. Lagers use a different type of yeast – a yeast that likes to ferment in relatively cool temperatures, for long periods of time. Good Lagers are also very delicate in flavor, generally lacking the fruity notes common in ales.The quality of ingredients and process show through in any beer, but even more so in a lager. Lagers are the ultimate showcase of process, technical understanding, and recipe formulation. This challenge is one of the reasons we invested in a 3-vessel, German style brewhouse so we’d be able to produce world class lagers, right here in Fairbanks. 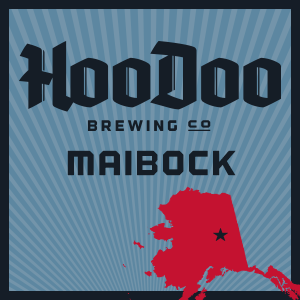 HooDoo Maibock pours a rich golden color with a creamy white head on top. The aroma is clean with an inviting malt complexity and a lightly spicy noble hop note. With the first sip comes a juicy hit of delicious German malts. Hints of honey, candy sugar, and clean aromatic hops. Medium bodied, the rich malty flavors are supported by a soft underlying hop bitterness, balancing the beer perfectly. 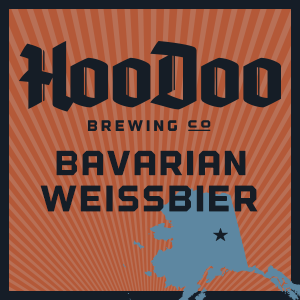 With Summer fast approaching Interior Alaska, few beers are more appropriate than our Bavarian Weissbier, a refreshing wheat beer brewed in the German tradition. If any beer will whisk your palette away to Munich, Germany, it is this one! Our take on the style is cloudy, crisp, and effervescent all while carrying with it a richness that only the finest German barley and wheat malts can provide. On top of these fantastic ingredients, the true star of the Weissbier is the yeast: This strain has been used in Germany for centuries and during fermentation, enriches the beer with heady banana, clove, and bubblegum flavor and aroma. Prost!